Ombra represents another successful collaboration between Mike Davies of Architecture HDT and Restauranteurs Russel and Elwyn Scott. The style is that of a 'bacaro', a Venetian café where locals would meet after work for a drink and light meal and the décor reflects this casual atmosphere. A new shopfront utilising original lead light glazing encloses the cafe in a traditional style, reflecting the heritage of the building and adding character to both the interior space and the exterior façade. The semitransparent linen curtains provide views out to the street while allowing only shadowy views to the inside. This curtaining is hand embroidered with ‘Ombra’ and is the only street level signage to be seen. The original heritage fabric of the building is exposed. The original damaged dado tiling, crumbling plaster and the exposed seismic strengthening steelwork not only add character but allow the building’s history to be understood. Demolition boarding has been used to line the walls and counter fronts and conduits and copper piping have been left exposed to view. A new pressed metal ceiling compliments the character of the space and is finished to appear old and rusted. This ceiling is carefully designed with perforations and acoustic blankets above to provide important sound absorption to what would otherwise be a very noisy space. The compact layout incorporates a bar area and an open kitchen where customers can watch food being prepared and sit at the counter to eat and chat with the chef. The relationship between front and back of house activities adds life and vibrancy to the dining experience. 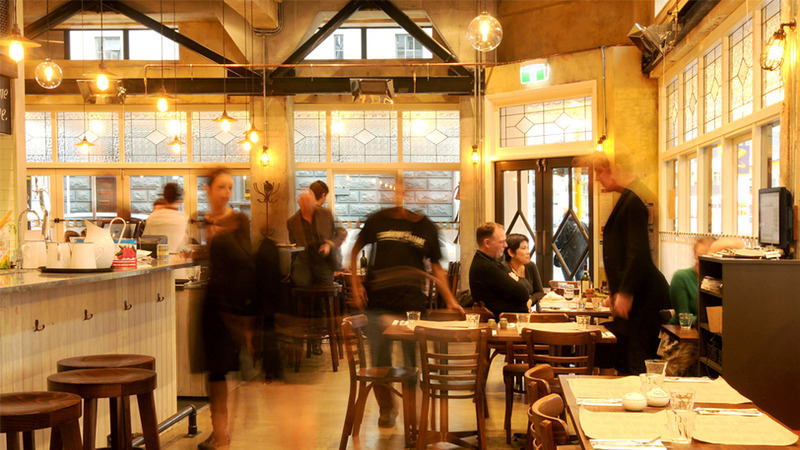 This popular new establishment is the perfect fit for both our client and the style of building, contributing enormously to this Cuba Street dining precinct.